Washington, DC, Nov. 8, 2011 - The 53rd Annual Washington International Horse Show (WIHS), held Oct. 25-30 at Verizon Center in downtown Washington, DC, engaged and entertained more than 150,000 horse enthusiasts at the show and through its free live streaming event, reaching an unprecedented audience for this historic Washington, DC fixture. 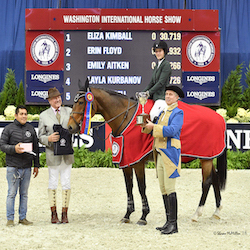 "We are thrilled with the success of this year's Washington International," said Juliet W. Reid, show president. "Not only was the quality of the horses and riders spectacular but we also added new exciting exhibitions and utilized new technology to build our relationship with the equestrian community at the show, across the country and around the world." Through its first live streaming event, available free to the public, WIHS fans could follow the hunter and show jumping competition as well as the entertaining exhibitions in the ring from the opening class on Tuesday to the final victory lap on Sunday. "We were delighted and a little surprised at the incredible response we had to our first live stream," said Bridget Love Meehan, executive director. "Our webcast, available on our website, was accessed more than 130,000 times by show fans in 56 countries. It did an incredible job of adding value for sponsors and visibility for the show. Key classes will be archived and available on wihs.org, including the Puissance high jump, the President's Cup Grand Prix, the WIHS Equitation Finals, plus other classes and some of the fun in the ring." Entertaining exhibitions included a first for WIHS - mutton busting, a hilarious rodeo-style competition for children. Another new event was Guy McLean, an Australian horse trainer with amazing skills. Back by popular demand were Chester Weber, the national four-in-hand driving champion, who wowed the crowd with his skillful handling of the team throughout the ring full of fences and the perennial favorite terrier racing. Several popular events were back this year with renewed gusto. Thursday's Barn Night, presented by Dover Saddlery and the Peterson Family Foundation, was a hit as more than 1,400 youngsters from local barns and riding clubs joined the audience and entered contests to win great prizes. The evening's highlight was the Gamblers' Choice Costume Class, where the surprise feature was a joker fence made out of edible cupcakes by Georgetown Cupcake, complete with a camera crew filming for TLC's reality show, DC Cupcakes. And, Sunday morning welcomed local D.C. families and supporters for the second annual Halloween-themed Brunch at the Barn. Saturday's rain and snow caused barely a hiccup as WIHS Kids' Day, an outdoor event, moved indoors to Verizon Center's concourse. Thousands of children enjoyed free family-friendly activities supported by EQUUS Foundation, including a real pony being painted by a Native American artist, horseshoe painting, a book nook, face painting and other educational activities. "We are grateful for the support of our many sponsors, whose participation ensures the future of WIHS, the country's leading metropolitan indoor horse show," said Meehan. "WIHS is more than an annual show - it's an essential part of training young riders, preparing professionals for international competition and celebrating the year-long accomplishments of the best in our sport, and we couldn't do it without our generous sponsors." WIHS partnered with many new supporters including Fidelity Investments, Lufthansa Private Jet, Dreamworks, Tiny Jewel Box, the Smithsonian Institution's National Museum of the American Indian, eyeD and Marshall & Sterling, and welcomed back many returning sponsors including Animal Planet, Comcast, Boeing, Events DC, Honeywell International, Chevron, RBC Capital Markets, Textron, Platinum Performance, Johnson Horse Transportation, Pedigree/Mars and others. The WIHS tradition of honoring the military continued in full force. The Military Ticket Program provided thousands of complimentary tickets to military families in the local area. On Saturday night, WIHS hosted the U.S. Army's Caisson Platoon center stage for a moving, patriotic demonstration. For the second year, WIHS recognized Tragedy Assistance Program for Survivors (TAPS), as its charity partner. Since its foundation in 1994, TAPS has provided counseling and assistance for more than 30,000 surviving family members of fallen service men and women. WIHS social media coverage on Facebook and Twitter provided constant online entertainment for the live audience and fans at home. @WIHS tweeted about competition results, Barn Night events, Kids' Day activities, book and autograph signings, arena performances, live streaming and more. Facebook posts included photographs provided by Shawn McMillen Photography, videos produced by ShowNet and Verizon Center, or links to the WIHS website and live stream provided by EquestrianSport.tv with support from ShowNet, Ryegate Show Services and Verizon Center, and included iPhone and iPad availability. Video clips were also linked in WIHS press releases so thousands could watch the winning rides as they read the news. WIHS embraced another new technology with online bidding for its popular Silent Auction, allowing supporters to join in the fun wherever they were during the show. "We are thrilled at the outcome of this year's show," said Meehan. "With the renewed energy, new features, sponsors and partners, and more entertainment value, our horse show in the city is in a great position to continue to develop as an annual must-see event for equestrians and the Washington, DC community." 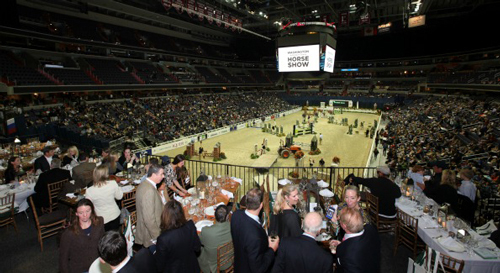 The 54th Washington International Horse Show will be held Oct. 23-28, 2012 at Verizon Center in downtown Washington, DC. For more information on the Washington International Horse Show, please visit www.wihs.org. An equestrian tradition since 1958, the Washington International Horse Show is the country's leading metropolitan indoor horse show and a pinnacle of the equestrian year with leading riders, including Olympic medalists, and fabulous horses. More than 500 horses participate in show jumping, hunter and equitation events during the six-day show. Highlights include the $100,000 President's Cup Grand Prix, the Puissance high-jump competition; and WIHS Equitation Classic Finals featuring the country's top junior riders. Special exhibitions, boutique shopping and community activities round out this family-friendly event. Since its debut, the Washington International has been a Washington, DC, institution attended by presidents, first ladies, celebrities, business and military leaders, as well as countless horse enthusiasts of all ages. Washington International Horse Show Association, Ltd. is a 501(c)(3) nonprofit charitable organization headquartered in Washington, DC.